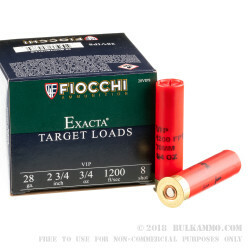 This 28 gauge shotshell load from Fiocchi works well for both target shooting and bird hunting. 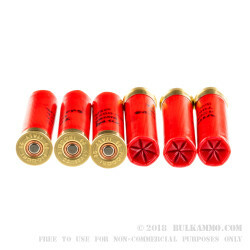 Each shell in this box of 25 fires 3/4 oz. 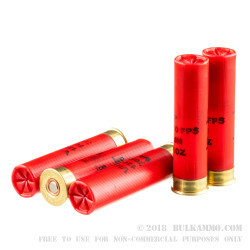 of #8 birdshot at a muzzle velocity of 1,200 feet per second. This configuration produces great patterning and the light recoil characteristic of the 28 gauge. 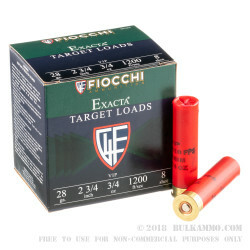 Fiocchi is an Italian manufacturer based in Lecco, Italy; its US operations are located in Ozark, Missouri and produce the majority of Fiocchi shotshell and centerfire ammo sold on the US market.